"The Restoration" redirects here. For the 1910 American silent film, see The Restoration (1910 film). For details of the Scottish, Irish and colonial restorations, see Restoration (1660). King Charles II, the first monarch to rule after the English Restoration. 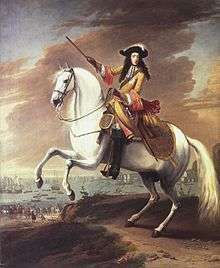 The Restoration of the English monarchy began in 1660 when the English, Scottish and Irish monarchies were all restored under Charles II after the Interregnum that followed the Wars of the Three Kingdoms. The term Restoration is used to describe both the actual event by which the monarchy was restored, and the period of several years afterwards in which a new political settlement was established. It is very often used to cover the whole reign of Charles II (1660–1685) and often the brief reign of his younger brother James II (1685–1688). In certain contexts it may be used to cover the whole period of the later Stuart monarchs as far as the death of Queen Anne and the accession of the Hanoverian George I in 1714; for example Restoration comedy typically encompasses works written as late as 1710. It was into this atmosphere that Monck, the governor of Scotland under the Cromwells, marched south with his army from Scotland. Lambert's army began to desert him, and he returned to London almost alone. Monck marched to London unopposed. The Presbyterian members, excluded in Pride's Purge of 1648, were recalled, and on 24 December the army restored the Long Parliament. Fleetwood was deprived of his command and ordered to appear before Parliament to answer for his conduct. On 3 March 1660, Lambert was sent to the Tower of London, from which he escaped a month later. He tried to rekindle the civil war in favour of the Commonwealth by issuing a proclamation calling on all supporters of the "Good Old Cause" to rally on the battlefield of Edgehill, but he was recaptured by Colonel Richard Ingoldsby, a participant in the regicide of Charles I who hoped to win a pardon by handing Lambert over to the new regime. Lambert was incarcerated and died in custody on Drake's Island in 1684; Ingoldsby was indeed pardoned. On 4 April 1660, Charles II issued the Declaration of Breda, in which he made several promises in relation to the reclamation of the crown of England. Monck organised the Convention Parliament, which met for the first time on 25 April. On 8 May it proclaimed that King Charles II had been the lawful monarch since the execution of Charles I on 30 January 1649. "Constitutionally, it was as if the last nineteen years had never happened." Charles returned from exile, leaving The Hague on 23 May and landing at Dover on 25 May. He entered London on 29 May, his birthday. To celebrate his Majesty's Return to his Parliament, 29 May was made a public holiday, popularly known as Oak Apple Day. He was crowned at Westminster Abbey on 23 April 1661. Some contemporaries described the Restoration as "a divinely ordained miracle." The sudden and unexpected deliverance from usurpation and tyranny was interpreted as a restoration of the natural and divine order". The Cavalier Parliament convened for the first time on 8 May 1661, and it would endure for over 17 years, finally being dissolved on 24 January 1679. Like its predecessor, it was overwhelmingly Royalist. It is also known as the Pensionary Parliament for the many pensions it granted to adherents of the King. The Indemnity and Oblivion Act, which became law on 29 August 1660, pardoned all past treason against the crown, but specifically excluded those involved in the trial and execution of Charles I. 31 of the 59 commissioners (judges) who had signed the death warrant in 1649 were living. In the ensuing trials, twelve were condemned to death. Fifth Monarchist Thomas Harrison, the first person found guilty of regicide, who had been the seventeenth of the 59 commissioners to sign the death warrant, was the first regicide to be hanged, drawn and quartered because he was considered by the new government still to represent a real threat to the re-established order. In October 1660, at Charing Cross or Tyburn, London, ten were publicly hanged, drawn and quartered: Thomas Harrison, John Jones, Adrian Scroope, John Carew, Thomas Scot, and Gregory Clement, who had signed the king's death warrant; the preacher Hugh Peters; Francis Hacker and Daniel Axtell, who commanded the guards at the king's trial and execution; and John Cooke, the solicitor who directed the prosecution. Of the eleven Protectorate baronetcies, two had been previously granted by Charles I during the Civil War — but under Commonwealth legislation they were not recognised under the Protectorate (hence the Lord Protector's regranting of them), however when that legislation passed into oblivion these two baronets were entitled to use the baronetcies granted by Charles I — and Charles II regranted four more. Only one now continues: Sir Richard Thomas Willy, 14th baronet, is the direct successor of Sir Griffith Williams. 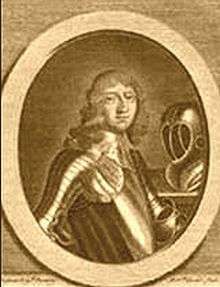 Of the remaining Protectorate baronets one, Sir William Ellis, was granted a knighthood by Charles II. The one hereditary viscountcy Cromwell created for certain,[lower-alpha 1] (making Charles Howard Viscount Howard of Morpeth and Baron Gilsland) continues to this day. In April 1661, Howard was created Earl of Carlisle, Viscount Howard of Morpeth, and Baron Dacre of Gillesland. The present Earl is a direct descendant of this Cromwellian creation and Restoration recreation. Historian Roger Baker argues that the Restoration and Charles' coronation mark a reversal of the stringent Puritan morality, "as though the pendulum [of England's morality] swung from repression to licence more or less overnight." Theatres reopened after having been closed during the protectorship of Oliver Cromwell, Puritanism lost its momentum, and the bawdy "Restoration comedy" became a recognisable genre. In addition, women were allowed to perform on the commercial stage as professional actresses for the first time. In Scotland, Episcopacy was reinstated. In April 1688, James re-issued the Declaration of Indulgence and ordered all Anglican clergymen to read it to their congregations. When seven bishops, including the Archbishop of Canterbury, submitted a petition requesting the reconsideration of the King's religious policies, they were arrested and tried for seditious libel. On 30 June 1688, a group of seven Protestant nobles invited the Prince of Orange to come to England with an army; by September it became clear that William would invade England. 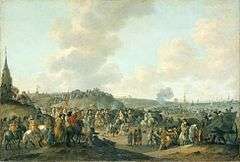 When William arrived on 5 November 1688, James lost his nerve, declined to attack the invading Dutch and tried to flee to France. He was captured in Kent; later, he was released and placed under Dutch protective guard. Having no desire to make James a martyr, William, Prince of Orange, let him escape on 23 December. James was received in France by his cousin and ally, Louis XIV, who offered him a palace and a pension. ↑ CEE staff 2007, Restoration. ↑ EB staff 2012, Restoration. ↑ Keeble 2002, pp. 8–10. ↑ Hutton 2000, p. 121. 1 2 3 4 5 Chisholm 1911, p. 108. ↑ Harris 2005, p. 47. 1 2 Pepys Diary 23 April 1661. ↑ Jones 1978, p. 15. ↑ Clark 1953, p. 3. ↑ Harris 2005, pp. 52–53. ↑ Baker, Roger (1994). Drag: A History of Female Impersonation In The Performing Arts. New York City: NYU Press. p. 85. ISBN 0-8147-1253-3. Chisholm, Hugh, ed. (1911). "Lambert, John". Encyclopædia Britannica. 16 (11th ed.). Cambridge University Press. pp. 108,109. Keeble, N. H. (2002). The Restoration: England in the 1660s, History of Early Modern England Series. Oxford: Blackwell Publishers. ISBN 0-631-23617-1.